Give your ride a dose of modern comfort and style in the 2017 Nissan Versa Note. Up front, you get the star treatment, especially when you opt into Nissan's handsome leather-wrapped steering wheel and faux suede upholstery. 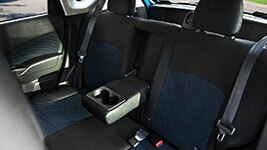 Travel anywhere with your four besties - the rear seats offer plenty of legroom for a comfy ride. The cargo hold is also incredibly versatile, making this sporty hatchback an excellent pick for surfers, musicians, and social butterflies alike. Fold down all or part of the 60/40-split rear seats to stow longer items like surfboards. The innovative Divide-N-Hide adjustable floor lets you stow cargo items out of sight from would-be thieves. Put a personal spin on your 2017 Nissan Versa Note with Nissan's Color Studio. Choose from a range of wild paint colors so everyone can see you coming. If you want to offset your model's Deep Blue Pearl exterior with orange side mirror caps and door handle covers, nothing is stopping you. Or choose the Aspen White body and add just a splash of color with sporty Black Purple trim. Your Versa Note is your canvas, offering another layer of fun. Technology is another of the 2017 Nissan Versa Note's strong suits. The NissanConnect infotainment is your central hub for, well, just about everything. The system's mobile apps connectivity lets you do everything from browse Pandora radio stations to check your Facebook page. That means long road trips are never without fresh new tunes and always know what your friends are up to. When you add navigation into the mix, you'll never have to worry about missing an exit. The 2017 Nissan Versa Note can fit into parking spaces too slim for other vehicles, a major bonus to the subcompact class. In addition to its compact dimensions, the class-exclusive Around View monitor gives you a 360-degree, top-down look at your Versa Note, so you won't scuff the paint as you ease into a tight spot. Other safety features, like the antilock brakes, boost driver confidence by supplying excellent control over performance. When you fill your tires, the Easy-Fill Tire Alert system beeps when you've reached the proper psi. With proper tire inflation, your Versa Note can maximize fuel economy, helping you save the absolute most at the pump. A sporty hatchback at its core, stylish design features like a unique roof spoiler sets the Versa Note apart from its competition. A hatchback doesn't have to mean no cargo space. 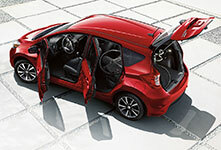 Adaptable 60/40 split back seats means you can carry tall cargo and passengers too. Check out your surroundings before you back up, adding another layer of safety with the Around View Monitor. This fun subcompact adds a layer of luxury with heated front seats, a blessing on early winter morning commutes. The 2017 Nissan Versa Note isn't just incredibly affordable - it's roomy, tech-savvy, and equipped with the kind of safety gear that gives you peace of mind up and down the highway. In short, it's the total package. Settle into your Versa Note and enjoy supportive comfort all the way to work, school, or wherever the road rises up to meet you.